The Autism Research & Resources of Oregon (ARROAutism) is a not -for-profit organization located in Oregon. We assist with Autism research projects in Oregon, develop resources to meet unmet needs for families and individuals with Autism in Oregon, and assist families and individuals with Autism to locate already existing resources that meet their needs. 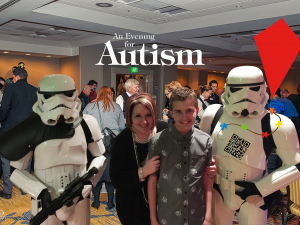 ARROAutism’s long term goal is the development of the Oregon Autism Center where we will bring together a wide variety of organizations, agencies, professionals, and projects to provide the families and individuals with Autism in Oregon access to resources that encourage and promote their integration in their community, and improve their quality of life. ARROAutism welcomes the support of its community partners, like Rose City Classics, ECLAT Tech, Rock for Autism, and individual donors without whom the three year pilot community center project (aka the ARROAutism Westside Family and Community Center) and other ongoing projects, like the Family Holiday Assistance Project, would not have been possible. To learn more about how your organization or company can be a part of creating a center of excellence in Oregon, please Contact Us today!